The RFS was supposed to alleviate “global warming” and dependence on costly foreign oil. But it solves neither problem: it’s impact on the former is overrated and American fracking fixed the latter. Instead, the RFS subsidizes job loss, decreases fuel efficiency, and ruins your engines while it costs you between $.13 and $.26 per gallon in 2017! Congress passed the RFS initially in the Energy Policy Act of 2005 and enhanced it in the Energy Independence and Security Act of 2007. It establishes an annual US biofuels consumption schedule that crescendos to a quota of 36 billion gallons in 2022, 15 billion of which may come from corn-based ethanol. The consumption quota must be met by US oil refiners, blenders, and importers, holding companies responsible for biofuels consumption level scaled to their oil production. Among other requirements, the RFS sets baselines for biofuels emissions and compliance. Since producing and blending ethanol is unrealistic for many oil refiners due to expensive capital costs, Congress created “Renewable Identification Numbers” (RINs), tradable credits for meeting biofuels mandates. Companies issue RINs and report them to the Environmental Protection Agency (EPA) at the point of biofuels production. Oil refineries that don’t produce biofuels can buy RINs from those who do. RINs prices fluctuate widely and are subject to Wall Street speculation. Basically, the federal government created a fake market that redistributes wealth to big ethanol producers. Meanwhile, refineries without ethanol production capability lose profitability. RINs cost jobs in some cases. Philadelphia Energy Solutions, the largest refinery on the East coast, filed for bankruptcy while citing the RFS and expensive RINs as the cause. About 1,100 jobs are at stake. Oil refineries that manage to stay in business do so by passing RINs costs to consumers. So the RFS makes you pay more for worse fuel. Prior to the RFS, vehicle gasoline contained small amounts of ethanol, but today, the minimum ethanol content EPA-compliant fuel is “E10,” the common gas that virtually everyone purchases. The US Energy Information Administration admits that “E10” gasoline is 3% less efficient than gas without ethanol. But with the RFS, you pay both RINs and gas costs instead of just gasoline’s price. That’s why the Congressional Budget Office estimated between a $.13 and $.26 price hike for gasoline and a $.30 to $.51 raise for diesel from the RFS, both higher than the federal taxes on each product. RFS hidden taxes could skyrocket if fuel demand grows further. As 2022 approaches, RFS implicit costs will become greater too. Fuel blends with higher ethanol content than E10 might cause vehicle problems. Further dependence on biofuels will require greater use of fuels such as “E85,” a blend containing at least 51 percent ethanol. Yet, “fuel-flex” vehicles, the only kind capable of using E85 account for 20 million or 7.5 percent of US vehicles. Worse, over 90 percent of fuel flex vehicles do not have access to E85 fueling stations within their zip code. Not to mention that E85 fuel is up between 15 and 27 percent less efficient than gasoline. This efficiency reduction leads E85 to cost more per mile than gasoline on average. There’s no incentive for Americans to boost E85 consumption since it costs more. Any significant move towards E85 fuel would have to be coerced by government. Lower blends than E85 could cause harm as well. The American Automobiles Association claimed that 85 percent of vehicles on the road in 2015 were not approved by manufacturers for E15. The EPA disputes this claim, and approved all vehicles manufactured in or beyond 2001 as E15 compatible. Moving ethanol concentrations beyond E10 is known as the “blend wall,” a limit imposed on ethanol consumption by the nature of vehicle engines. The blend wall, as well as fuel consumption fluctuations, has forced the EPA to REPEATEDLY use Clean Air Act provisions to lower mandatory RFS benchmarks originally set by Congress. This is an indictment of the RFS as too harmful to implement. Perhaps, worst of all, ethanol is not great for the environment. Yes, burning ethanol releases fewer greenhouse gases than fossil fuels. However, when considering lost efficiency, production processes, and combustion emissions, ethanol may be worse than good ole gasoline. Government estimates for ethanol emissions are often wrong and numerous health and emissions impacts from land use may amplify at higher consumption. 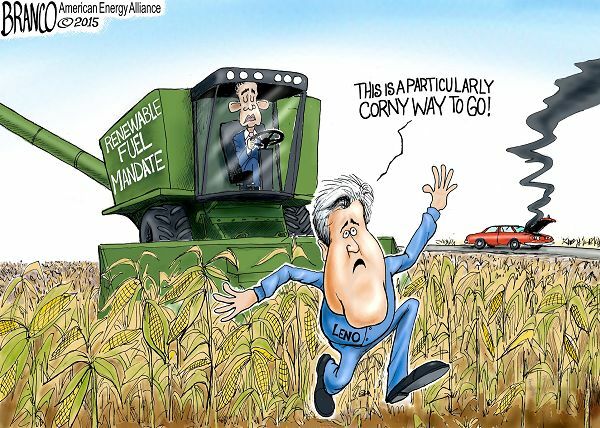 That’s why even the far left environmentalist Sierra Club opposes further ethanol mandates. Congress should immediately repeal the RFS before any talk about hiking the gas tax. This costly policy makes fuel expensive, vehicles degrade, and greenhouse gases grow. Ethanol producers enjoy small benefits while large and dispersed costs fall on everyone else. Bigger taxes are always bad -- especially hidden ones like the RFS.